Last week, I played in a uni hockey tournament after work. The day before I asked people in the office what flavour cupcakes I should make to keep us going. 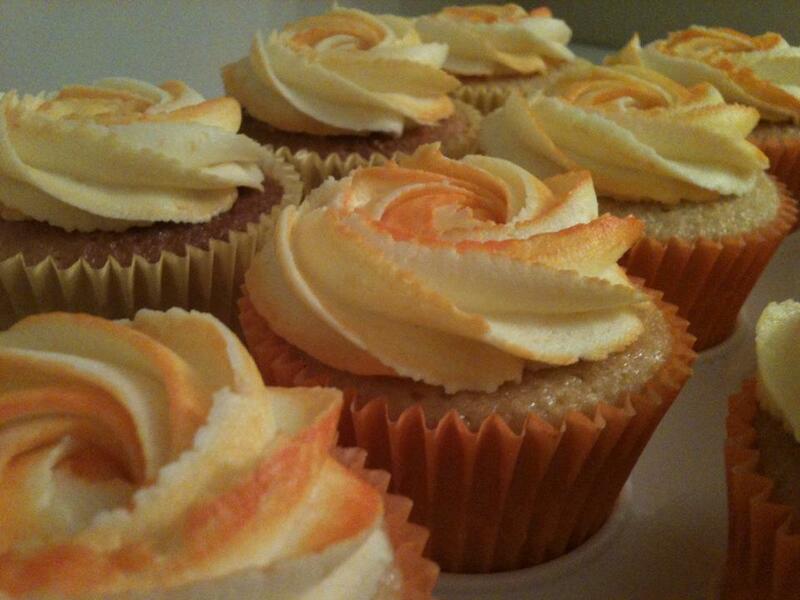 James suggested “Lucozade” and Kiri suggested “half time orange” cupcakes. So I went with Orangeade – I bought a sample pack of Soda Stream syrups when I made some Cola cupcakes a while ago and I hadn’t used any of the other flavours yet so I decided to give the orange one a go. I’ve got to admit, these weren’t my favourite. 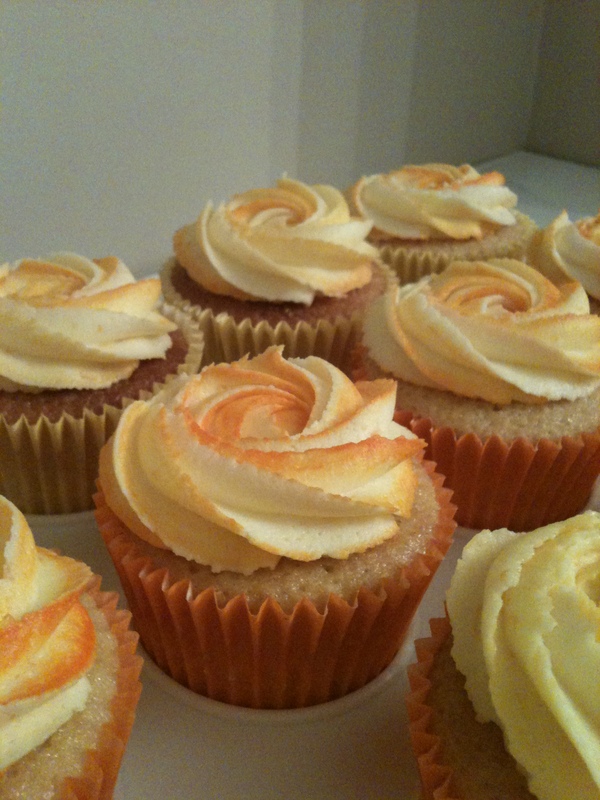 They had a bit of tang/after taste – I’m guessing due to the orange syrup – so I think I would have preferred just plain orange but I’m going to post them anyway mainly because of the icing. I decided to have a go at painting lines of food colouring down the side of the piping bag to give a two-tone effect – I used a thin paintbrush to paint 4 stripes of yellow food colouring down the inside of the piping bag. I was pleased with the result – the first 10 looked great but after that the two-tone effect wasn’t so obvious so not next time I’d probably use two bags. If you want to make the cupcakes the recipe is below. Mix the sugar, flour, butter, baking powder, orange zest and salt together in a stand mixer (or rub in with your hands) until the mixture resembles fine breadcrumbs. Beat the milk, eggs and syrup together in a jug and then gradually beat into the dry ingredients until smooth (ensuring that you scrape down the sides of the bowls after each addition). Beat the icing sugar and butter together on a very slow speed until the mixture resembles coarse breadcrumbs. I always put a tea towel over the top of my KitchenAid to prevent icing sugar going everywhere! Then slowly add the milk and syrup. Once it’s all been added increase the speed and beat on high for 5 minutes until light and fluffy.